You can’t have a Christmas celebration without a little snow. 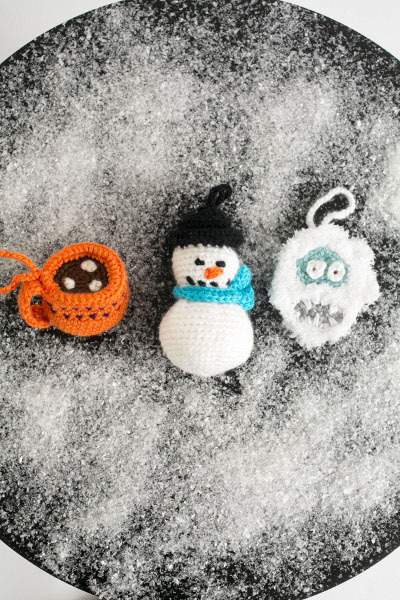 This adorable ornament set featuring the Abominable Showman, Itty Bitty Snowman and Mini Cup of Cocoa, is just what your tree needs this year. 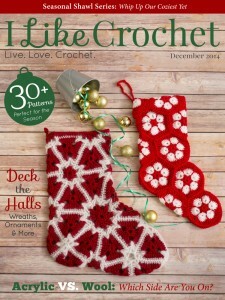 You will use 1.5 mm hook on the patterns unless otherwise specified. This ornament is flat and is made in sections. You can use any fuzzy yarn as a substitute for the Bernat Tizzy (Color O) yarn, as needed. Using Color A, ch 4. Using Color E, ch 9. Row 5: Turn, sc dec two times. Using Color F, ch 9. Lay piece right side up with the chain at top. Join Color A at top right, ch 1, sc using the 2nd and 3rd row as stitches to create the teeth. Work around the mouth. You can use yarn needle to create same effect if preferred. Using Color A, ch 2. Using a yarn needle, sew the face and the mouth onto the head. Sew the eyes onto the face. Using Color C and yarn needle, stitch one time in center of eye to create pupil. Using Color O and yarn needle, weave in and out around the head. Tip: Cover 3-4 stitches at once to allow the textured yarn to cover the face evenly. To cover the back, if preferred, glue or sew on a piece of fabric. Trim to size. This pattern is made from the bottom up. Rnds 27-31: Sc in each stitch. Using Color H, ch 50. Turn, dc in third chain from hook and in each across. 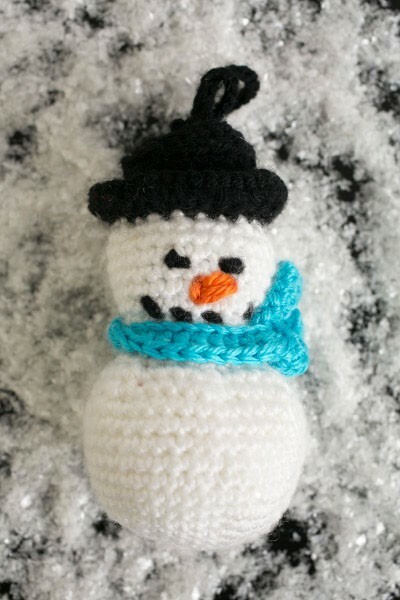 Using yarn needle, embellish the face onto the snowman. Tie the scarf on the neck and stitch it into place at the back of neck. 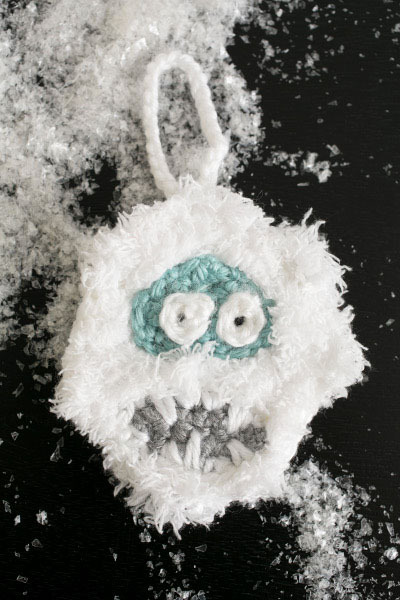 Stuff the snowman with fiberfill. Using yarn needle, sew the hat topper into place. Using Color G, ch 2. Rnd 11: Join Color D, by carrying the yarn, alternate Color G and Color D every other stitch, sc in each stitch. Rnd 12: Using Color G, sc in each stitch. Rnd 13: Repeat Round 11. Rnd 14: Using Color G only, fasten off Color D, sc in each stitch. Rnd 15: Sc in each stitch, sl st to first stitch of round to join. Rnds 17-26: Turn, ch 1, sc 3. Fasten off, leaving a long tail. Using Color N, ch 2. Using yarn needle and Color B, embellish the cocoa top with ‘marshmallows’. Using long tail from handle, sew into place. 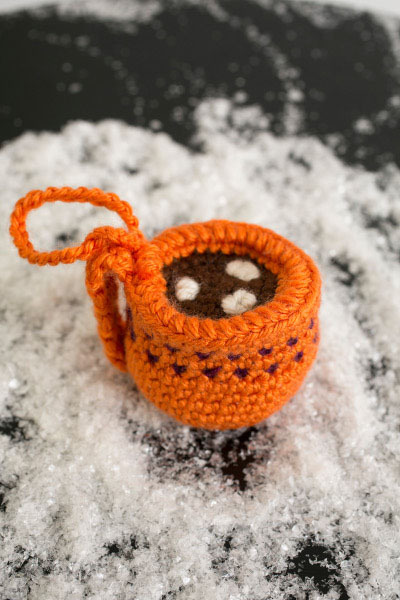 Using yarn needle and color G, sew the cocoa top onto mug. Fasten off. Weave in ends. Join Color G at stitch by handle, ch 26, sl st to same stitch. Fasten off. Weave in ends.